A cutaway of a standard Yale lock. This lock has a rotating cylinder that is held fast in the bolt by a series of five spring-driven pins of different heights. The key has five notches on it that correspond to the heights of the five pins. When the correct key is inserted, the pins line up level, and the cylinder can be turned to disengage the bolt. If the wrong key is inserted, the pins catch. 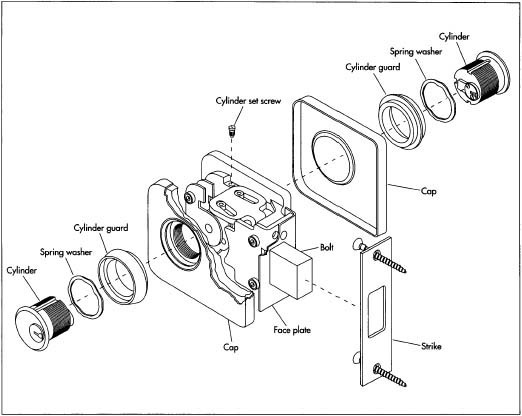 Cross section of a typical lock. plug is filled according to the key combination, the worker snaps or screws together the other parts around the lock. Though it is skilled work, it takes no special training, and these workers are not locksmiths.